Slice the beets thin. Really thin. Use a mandolin if you have one. If not, shoot for 1/4 inch thick or less. If you opt to roast the beets, slice them thin. 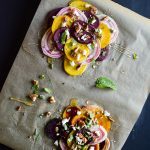 Line a baking sheet with parchment paper, and place the beet slices on them. Brush with olive oil and roast at 400 degrees for 20 minutes. Layer about 12 slices (raw or roasted) and top with pecans, mint, and goat cheese. Finally, drizzle with honey and enjoy!